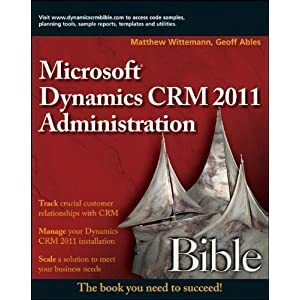 One of the most frequently asked questions on the newsgroups concerning Microsoft CRM 3.0 is, "What happened to the Settings area?" Usually after someone successfully completes an install or upgrade of CRM 3.0, one of the first things they do is install the Outlook client on their development machine. But almost immediately, folks realize that if the Outlook CRM client is open, then the web UI doesn't show the Settings area. First, you need to understand that even though the Outlook client is a huge (HUGE!) improvement over Sales For Outlook for CRM 1.2, it does not exactly match the functionality of the web interface for CRM. In most cases, there seem to be good reasons for this. Among the major items missing from the Outlook client are the Settings area and the Service Calendar. You also will notice that the Direct E-mail button is missing from the Account, Contact and Lead views. So what's going on? Well, simply put, the CRM Outlook client uses the same cookie as the web interface, so if you open the Outlook client and then open the web interface, the CRM server doesn't differentiate between the interfaces or create a new session for you. It still thinks you are in Outlook, and so it returns to you only the features that the Outlook client has requested. The workaround is simple. Because a cookie from a web session is tied to the domain name, all you need to do is access CRM through one URL for Outlook and a different one for the web UI. For example, if you set up Outlook to connect to http://crm, then you might access CRM in Internet Explorer by going to http://crm.mycompany.com or http://crm.mycompany.local. You may also be able to use an IP address for one of them. It all depends on how you have configured CRM in IIS and your network's DNS. Now you will be able to have both the Outlook client and the web UI open at the same time, with full functionality available! UPDATE: Here's a blog post from Prashanth Kaankadae's blog that documents in greater detail the differences between the Outlook client functionality and the full web UI. Perhaps it would be nice if MS stopped shirking their responsibilities and got out a proper fix/patch quickly? The problem we have with this workaround, is that due to running CRM client in a non-AD member PC (and DNS hosted by Unix from a different team), we cannot use http://crmserver in our Outlook-based client - it *has* to use the FQDN. But so does our web-based access because that goes through Unix web-caches, again, DNS is not hosted within MS/AD. Whilst using DNS aliases/IP might be a workaround, this means significant work for our organisation - of course, MS's response would be - well, that's your problem and you should run it in a 'supported' AD scenario! NOT GOOD ENOUGH! Another way to work around some of the items is to edit the SiteMap and remove the Client="Web" parameter. Major Thanks Matt for taking the time to write this up! I was able to send the link to my client dealing with the issue.